Scottish horror, The Dark Mile, from director Gary Love makes its debut at the Edinburgh International Film Festival. This intriguing piece of Scottish folk horror manages to be both progressive and traditional, making full use of its evocative Scottish locales. 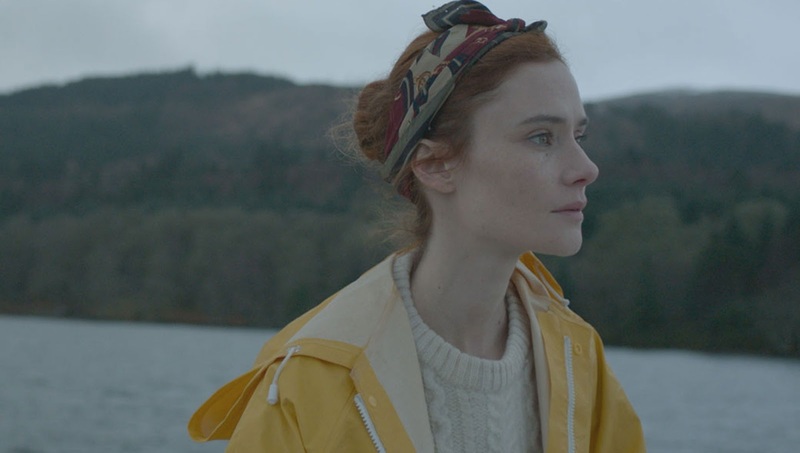 Clare (Deirdre Mullins) and her pregnant girlfriend Louise (Rebecca Calder) attempt to heal their fragile relationship by hiring a boat and travelling through the Scottish Highlands. However, after several dubious run-ins with the locals, the pair's relationship is only stretched further. Cinematographer John Pardue shoots the film with a masterful eye capturing the sheer visual spectacle and beauty of the rural Scottish locations. The dense forestry, eerie isolated lakes, and dated rural interiors set a tone of trepidation and unrest from the onset. The Dark Mile has a continual sense of unease and foreboding dread as Clare and Louise travel through these evocatively sinister locations. The locations also lend themselves to the pagan folk horror undertones that are cautiously scattered throughout the film through talk about pagan fertility sects and shady glimpses stag-headed gods. It's hugely refreshing to see screenwriter Gaby Hull centre The Dark Mile on a lesbian couple. Like Edward Woodward's devout Christian copper Sgt. Howie being placed on pagan Summerisle in The Wicker Man, we have a similar fish out of water approach for The Dark Mile with a liberal couple placed in the heart of the 'sheltered' Highlands. Therefore, there is much of the familiar odd looks from locals in dingy local pubs as the two girls show affection - adding further unease to this tale. Love shoots much of the film with a voyeuristic eye (e.g. regular point of view shots staring into the boat) breeding a sense of paranoiac uncertainty between the girls. Love adds several genre set-pieces to the project including a tense boat pursuit, a chase through the dark forestland, amongst others. However, the final moments of The Dark Mile feels rushed and underutilising of the brooding pagan horror elements that are skilfully built up throughout the narrative. Attempting to leave much to the imagination, The Dark Mile leaves slightly too much with the final act being shot as a hazy montage that squanders the previously taut dramatic tension. This also means that Sheila Hancock's supporting turn also feels significantly less fun than it could have been - despite the actress bringing her usual class and charisma to the fold throughout. The Dark Mile is an evocative, beautifully crafted horror that showcases a stirring tension throughout. Some of this unfortunately feels squandered by a slightly ham-fisted finale.